Born in Montreal, P.Q., he studied two years at the Montreal Museum of Fine Arts under Dr. Arthur Lismer and Goodridge Roberts. Subsequently he went to New York where he attended the Art Students’ League under Will Barnet and Frank J. Reilley. It was also there in 1949 that he worked as an assistant to Mr. Ray Bailley on the now defunct comic strip “Bruce Gentry”. Returning to Montreal he became a draughtsman in his father’s architectural firm (Luke & Little) in 1951. He married in 1953 and turned exclusively to painting. His street scenes won him wide acclaim. 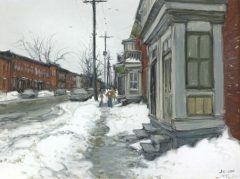 His paintings of old Montreal and Quebec City streets, houses and countryside were exhibited at the Watson Art Galleries. During a solo exhibition at this gallery in 1957 the Montreal Gazette noted, “His vision is clear and his interpretation of his subjects is solid and literal. His buildings are solidly based, bear the marks of age and are recorded with a laudable attention to drawing. The last-mentioned quality apparently presents him with no problems. His figures have animation, there is a convincing sense of movement in the crowds and the impression of traffic congestion in narrow streets is capitally conveyed . . . .” Little became an Associate of the Royal Canadian Academy in 1961. Today his work can be seen in the Continental Galleries, Montreal, and he is a highly respected artist. Dorothy Pfeiffer reviewing his work in 1964 noted, “Those bemoaning the seemingly ruthless demolition of hundreds of Montreal’s gracious old-world homes and other buildings, the disappearance in the name of progress of various little private nooks and parks, and the often callous disposal of dignified stone pillars and amusing cornices will gain nostalgic pleasure from John Little’s show, for he has dedicated his paintings to the preservation of such items for posterity. Yet so spirited and relaxed is his painting technique, that his work can in no manner today be labelled as merely documentary. He paints city streets ankle-deep in slush, where his not-quite-ripe olivegreen mixture carpets pavements with a mélange resembling Quebec limestone. He peoples his old streets and secluded sylvan sites with groups of today’s spirited adults and children . . . . Three important qualities it certainly contains: assurance, individuality and artistic honesty.” He has done covers for Maclean’s Magazine in which his great sense of humour blends with his artistic abilities to depict Canadians at work and play. He is represented in the National Gallery of Canada; Beaverbrook Art Gallery, Sir George Williams University Collection of Art, and many private collections.